Here are the jpeg images. 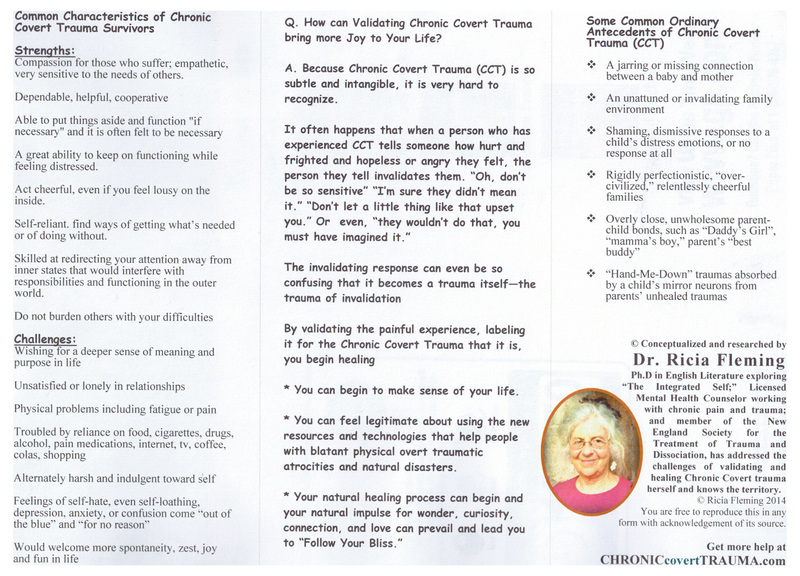 They’re too fuzzy to print out as brochures, but they give you an idea of what the CCT brochures look like and what information they contain. You can also see that there’s a space for you to add your own contact information if you want to. If you can use a CCT brochure, just write something like “please send me the CCT brochure” in the comments below, and I’ll send it to you as a Word document. Then you can print it up, add your contact information, hand it to people, and start talking face to face in real life. If that appeals to you. And if you would rather just hang out here, maybe printing up one brochure to carry around as a reminder that you aren’t the only one dealing with this, well, that’s good too. Whatever works for you. Ricia: please send me the brochure, I am looking forward to giving it to several people who “didn’t have a hard childhood”. I know mine was a rough one! The website is very easy to navigate and there is so much good information on it. Congratulations to you for shaping all your personal and professional experience and presenting it to the cyberworld. Thanks for replying and requesting the brochure, Don. I’m still a little shy about the internet, so I particularly appreciate (and admire) your taking action with this level of involvement. With your personal double history of both kinds of trauma and your successful journey through the very challenging process of recovery, you must be helping so many people. The brochure email is on its way to you and I’ve added a way for you to easily add your practice information on the back. Giving it out to people should add to the help you are already giving people. Blessings on the journey. Hi Ricia, I just discovered your website. I can totally relate to CCT. 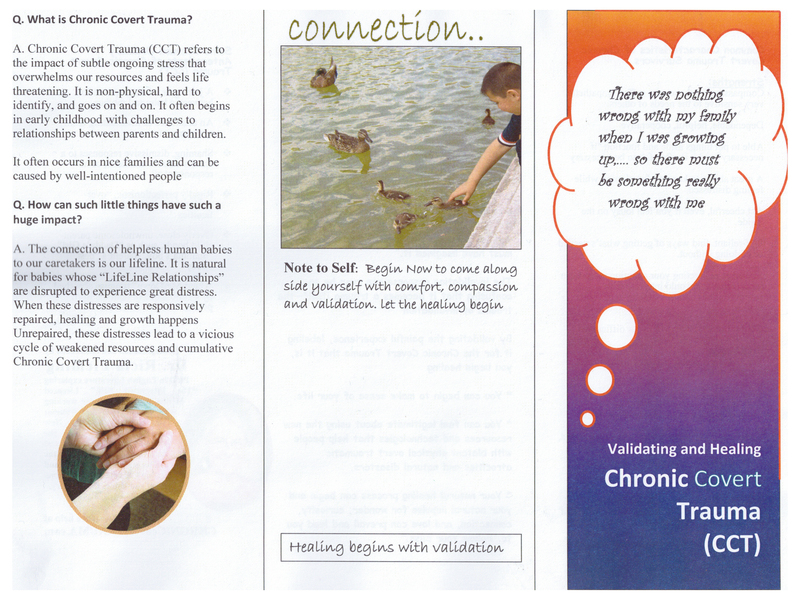 I am just realizing it now through an amazing IFS therapist that I have suffered from CCT in my family of origin. I would love the brochure to use with my clients. I am a therapist too. Thank you so much. Hi June, I hope you are feeling as much relief as I did when I discovered that there was a reason for the trouble I was having. Whew! And to then realize that all the breakthroughs in the world of trauma treatment, including IFS, can help in recovering from these non-physical, attachment CCTs. Your trifold brochure will be flying through cyberspace to you so you can spread the word and the relief to your clients. I’m so glad you discovered this site. Come back, please. A little affinity group community is growing here and your presence and comment is helping that happen. Thank YOU! I am a trauma therapist. I would love a copy of your brochure to share with others! I’ll send that right out to you. It’s so good to know you will be letting people know about this and helping to stop the shame people often feel for being upset about these non-physical attachment chronic covert traumas.